The "Chicken Coop" Also the "Royal Roost"
While we're all grown up now (at least physically), when we were teenagers in Anchorage, Alaska, The Coke Show with Ron Moore on KENI radio was our show. Starting at 6:00pm you could tune your home or car radio to KENI and hear not only the latest rock'n'roll hits of the day, but you could hear your friends calling in to the show to make requests or dedications. And you came to know some callers by the names they used, like "Pebbles" (from the Flinstones cartoon fame). 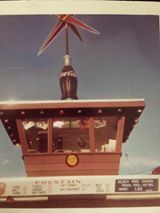 You could also drive into the Bun Drive-in parking lot, order a burger and a coke and look up at the small booth on top of the Bun Drive-in roof and catch a glimps of Ron Moore, the ring master and the guy making it all happen. From where I sat a couple of nights out of the week during the nightly broadcast of the Coke Show, I had a much different perspective than most Anchorage teens. Because Ron was also the host of Anchorages live teen TV dance program, The Varsity Show, I came to know Ron when I was fortunate enough to join what Ron affectionately called The Varsity Show Crew. Shortly after auditioning for a Varsity Show Crew position and being accepted to work on the show, Ron invited me and fellow Varsity Show Crew member Bob Martin to work with him during the Coke Show. Our job was to set up things in the small booth on top of the Bun Drive-in just before show time. We also had to send a sound signal to the main KENI studios to make sure the Coke Show program would be heard on the air. We were also responsible for having records ready to play when Ron introduced them, and starting the records on time. In addition, we answered the phone when Ron was busy and we took requests and dedications. Ron gave both me and Bob our on-air names. I was "Mighty Michael" and Bob was "Rapid Robert." I worked the show every other night and Bob worked the show when I wasn't there. On my first night working the Coke Show, I was very nervous as I walked up the stairs and unlocked the "Chicken Coop" which was the name Ron gave to the little booth we worked in. Ron would arrive after I had set things up, then he would tell me a little about that night's show. I remember a teen girl coming up to say hello to Ron one evening. As she stood in the booth while a song was playing, I "cued up" the next record on the turn table in front of me. Then Ron introduced the song and gave me the cue to let the song play. Ron quickly looked over at the turn table just as I discovered that the girl had put her purse right next to the arm of the turn table. When the arm moved just enough to touch her purse, the needle started skipping. Ron turned off the sound on the skipping record, opened his microphone and told everyone listening that we had a technical difficulty and that "Mighty Michael" would have it fixed in a moment. Bob Martin and I really enjoyed our time working behind the scenes on the Coke Show with Ron. We learned a lot from Ron and always appreciated his professionalism and generosity. Bob and I were a couple of Anchorage teenagers, barely dry behind the ears and except for The Varsity Show, we didn't have a lot of broadcast experience. So thank you Ron for giving two Anchorage teens the opportunity to be a part of the Coke Show. In closing, Bob Martin went on to host his own radio show in another state, and as I'm writing this story, I co-host a live weekly radio show in California. And you know what? Ron Moore, the Royal Coachman gave us both our start. Now looking back on the days of the Coke Show, Ron can say "here's another blast from the past, it was called the "Coke Show" and what a time it was. Fun and great times at the Bun Drive in. in my 1965 Chevy Nova. Sure miss those good times. What fun! I listened to the show all the time! Living in Valdez, radio was all we had, and I made good use of it. I could sing along with all of the hits, and The Coke Show was my favorite spot to hangout--even though I physically couldn't be there. Good job, all of you, and thanks for all the good memories! I remember a couple of times being in the booth with Ron as he interviewed members of our band "Mother's Apple Pie and Baseball Band". Also I am sure he interviewed members of the previous bands "Proof" and "The Arsons" that joined together to make this particular group. Good times! Join in and write your own page! It's easy to do. How? Simply click here to return to Coke Show Memories.